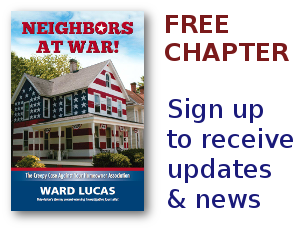 miltary Archives - Neighbors at War! Boom Goes The Egg Money! No Comments on Boom Goes The Egg Money! That’s Pennsylvania Dutch, and you can look it up if you’re interested. But it basically means that a homeowner’s savings are all gone. And that’s exactly what’s happening as FEMA redraws its maps for flood zones. A couple of years ago 20,000 homes were damaged or destroyed in a devastating flood in Boulder, Colorado. I remember it well because a close friend and I spent 12 hours trying to find a way out of the flooded streets, the collapsing pavement and entire homes drifting down the middle of major boulevards. We survived, but we had to endure waves of water crashing over my 2001 Blazer. I can personally testify that Chevy Blazers actually float…at least for a little while. Sometimes an Association-Governed Residential Community Board over steps its authority and attempts to impose its rules or its ideas of aesthetic appeal on its neighbors. In this case, the Condo Association decided that everyone, including Essex Property Trust, should want to invest in a resort-style pool renovation. Perhaps a more basic face lift would have been sufficient, not to mention less costly. I’d be willing to bet some of the condo owners feel the same way, although they are all obligated to pay assessment increases to cover the cost.